Presented simultaneously at both gallery locations In Focus 2012 celebrates the wealth of artists living and working in the Redlands and the important role art groups play in the cultural life of the region. This year artists from Redland-based art groups have created postcard size artworks in response to the theme ‘Art in life’ including painting, drawing, mixed media, photography and sculpture. 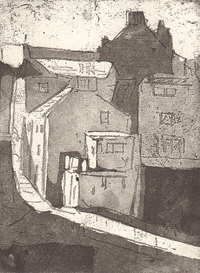 Image: Kathleen Dempsey, Street in the suburbs (detail) 2012, mixed media, etching and aquatint on paper. Courtesy of the artist.